As promised last week, I do have a great interview lined up for you this week and it’s today. I have the absolute pleasure to welcome CWA shortlisted crime writer, Stav Sherez to the blog. Right Stav, I’ve just spent about an hour sat in my back garden, listening to the birds twitter away as the sun starts to go down, trying to sort out a first question for you, but you are pretty much the crime worlds enigmatic man of mystery! You’re deep and brooding, your tweets (@stavsherez) are like poetry and in 2004 you were applauded for handling complex issues of morality, when shortlisted for the CWA John Creasey Dagger award. I’ve written and deleted a couple of starter questions, but really have no idea where to start, so please tell me, what makes Stav Sherez get out of bed in a morning? Oh, that’s an easy one for me! Coffee and cigarettes. That first espresso and slowly smoked cigarette of the morning, music drifting in and out as I wake up. And then it’s always back to the draft. So, in a more figurative way, I guess what gets me up in the morning is knowing I have a hell of a lot of work still to do on the book and that unless I do some and feel as if, even in the tiniest increment, the book is getting better, then I can’t enjoy my CDs or movies in the evening. So, what gets me out of bed in the morning is knowing I have to fix the previous day’s mistakes. You say mistakes with an air of certainty. As a published author of several novels, how does it feel, having started a new series, to know readers now have expectations, because of how well drawn your characters are? It’s a very different scenario than when I was writing the first three books, but the problems and questions you ask yourself are the same. The biggest problem I’ve faced, by far, is how to write similar scenes (discovery of body, autopsy, briefing etc.) and yet do them differently each time. A standalone forces you to write differently but the challenge in the series is how to vary the central tropes so that they are always fresh and interesting. How do you do your research for these books and how much importance do you place on it? Specifically the things you’ve mentioned like the autopsy and police briefings. I research quite a lot for the historical and political sections of the novels and I do it mainly by reading books. So, for A Dark Redemption I spent 6 months reading about African politics and history. For Eleven Days, I read as much as I could about Liberation Theology and Trafficking. But I don’t research the policing side. I think we all know, from countless books and TV shows, enough about police work, and the rest is a matter of intuition and imagination. I think verisimilitude is more important than strict realism. If the characters and plot feel believable then they are. Too much research is often evident in the finished book and detracts from the story. All research should always be subservient to the narrative. There does seem to be a massive thirst for crime fiction, both by the reading and viewing population. We are bombarded by brilliant stories and characters regularly. (I’m currently loving The Tunnel, TV series, which is crime, crossing borders between England and France) Is this something you enjoy when you’re not writing or do you like to take a break from the crime world? I love watching crime drama and reading crime novels and find them very useful when I’m writing. Novelists can learn a lot from well-made TV shows and films. Novelists can learn a lot from books that don’t work and from those that do. I think it’s essential to keep up to date with one’s genre, see what other people are doing and not doing. How important do you see events such as Bristol Crimefest and Harrogate Crime Writing Festival in the life of a crime writer? Extremely important. Both for promotion and for one’s own mental health! Writers spend all their time locked in a room alone, inside their own minds, and it’s great to be able get out. Meeting other writers puts one’s own problems into perspective. It’s lovely to meet readers too. Unlike musicians, writers don’t gig, so it’s very important to come to these festivals and meet fans. And every time I come back from Bristol or Harrogate I’m totally reinvigorated in my writing. Who have been the biggest influences on your writing? I guess the biggest influences are always the ones you stumble upon when you’re young. For me that was William Burroughs, Stephen King, Paul Bowles, Thomas Pynchon, Jim Thompson, Don DeLillo, Paul Auster – then, later, writers such as Cormac McCarthy, James Ellroy, James Sallis and Kem Nunn. Writers who have a particular way with language, heavily stylised writers. As a writer, what are your aspirations? To make each book better than the last. To write better sentences, tell bigger stories, to span generations and history through narrative and to keep the readers gripped and surprised. I’ve always loved paperbacks, both aesthetically and for ease of reading. These days, crisps. I love chocolate but it can bring on a migraine so have to ration myself very carefully. Thanks for sharing with us Stav, it’s been an absolute pleasure having you on the blog. 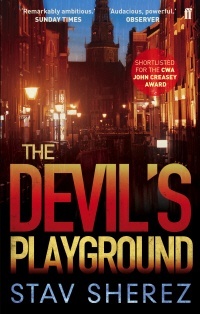 On the 1st May the 10th anniversary edition of Stav’s book, The Devil’s Playground (his first novel) will be released with a new after-foreward. 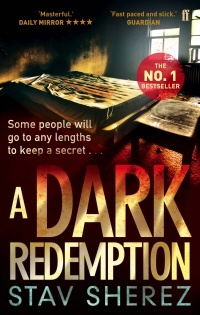 You will find my thoughts on A Dark Redemption, Here. Nice punchy, humourous interview Rebecca. I love how Stav is motivated to get out of bed my the need to fix the previous day’s mistakes. That sounds like it was fun to do Rebecca. Great interview. I agree, mixing with other writers certainly inspires. Chocolate migraine, I can relate, Stav. Thanks Glynis. I agree with the chocolate. Unfortunately, I still can’t seem to stay away! Rebecca – What a terrific interview! I can completely relate about the coffee! And I love the wide variety of influences too. Oh, about research? I couldn’t agree more; it’s an essential for a solid story. Thanks Margot. I wish I liked coffee, it smells so wonderful, but I just can’t seem to muster the same enthusiasm when I drink it! Such a casual, fun interview. Most I see are very stiff and formulated. Kudos to a great interviewer and interviewee! 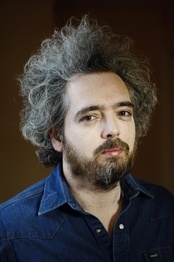 What an interesting interview of an author who I haven’t read… Yet ! Thanks Dianne. Lately I am forced from sleep by a puppy who wakes up with the birds! I like that comment about drawing a familiar scene but saying it differently. I notice authors attempting this. Sometimes they are brief. Other times, they offer up new information. An interesting approach. It is something about series that has to be considered isn’t it. Such valid points in crime fiction. How to have a death and solve it without it all sounding the same. Thanks Deb. Those chocolate migraines are bad aren’t they?! Glad you still hung on. It’s a hectic challenge.